Winter is well and truly here in Melbourne! Summer's been and gone and only 2 beers were added to the Summer Fruit Beer scetion. Never fear though, I've found what I hope will be the perfect winter fruit beer! Two Metre Tall is a brewery located in Tasmania, about 40 minutes from Hobart, on the banks of the Derwent River. It's a brewery I've been interested in trying the beers from for a long time. All of the ingredients to make their beers are farmed on site, which is a very rare thing indeed. As far as I'm aware they are the only Australian brewery to do this and I'd hazard a guess that there are not many others worldwide. 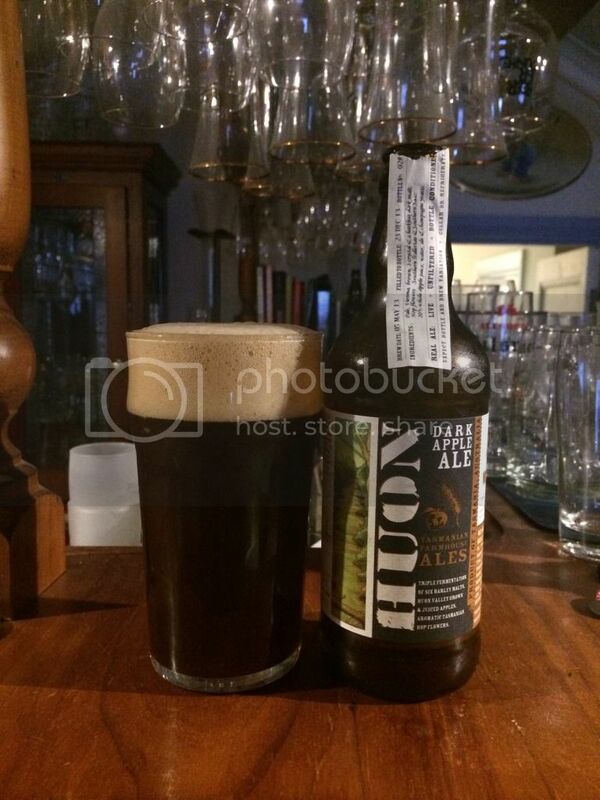 True to it's name, Huon Dark Apple Ale, pours a very dark murky brown colour. The head was somewhere in the spectrum of beige to khaki, depending on how the light was hitting it. It was quite a large head, which only had small bubbles form in it. The retention was excellent and there was at least a finger of head left when I finished drinking it. Onto the nose and the first thing that struck me was just how acidic the nose was! I had no idea what to expect with this beer, but a bitingly sour nose would not have been in my first 20 guesses! Once you ge over that shock to the system, dark malts become quite prominent and the sourness is more distinctively apple. It's a really interesting nose, which has piqued my interests for tasting! After the nose I knew what I was expecting and Huon certainly delivered. There was a light roast backbone of malt with the faintest hint that there might be some hops buried in this brew. The real feature of the beer though was a very strong acidic sour flavour of apples. At times I thought it might have been over the top and at others thought they could have gone a bit harder with it. The more the beer warmed the more the roasted flavour came through and really balanced out the beer. Two Metre Tall's Huon Dark Apple Ale is so much more than your average fruit beer. It took me almost half of the beer to work out if I loved it, was indifferent towards it or hated it. I think this was due to the unexpected, but greatly appreciated, sourness. I would highly recommend this to sour fans, it was really quite an enjoyable beer as it warmed up. I got all of dark, apple and ale so I think that Two Metre Tall have done a great job with this beer; can't wait to try more guys!